How do I get to The Ranches at Belt Creek? We are located on Belt Creek, on the edge of the Lewis and Clark National Forest, 29.54 miles / 37 minutes from the Great Falls International Airport, which is where you’ll want to fly into. We are about ½ way between Glacier National Park and Yellowstone National Park. What airlines fly into Great Falls? Great Falls is served by 5 airlines and those can be easily referenced through the airport website at www.flygtf.com for each of their schedules. Most travelers will experience a connection except those coming from Chicago, Phoenix, Las Vegas, Denver, Salt Lake City, Seattle, and Minneapolis. How is the Clubhouse laid out? The main Clubhouse includes the dining room, kitchen, cozy luxurious sitting area with a fireplace, 2 restrooms, an egress to an outside deck with an outdoor fireplace, a pool table and the Main Office. The spacious bar has a flat screen TV with satellite service and DVD player. 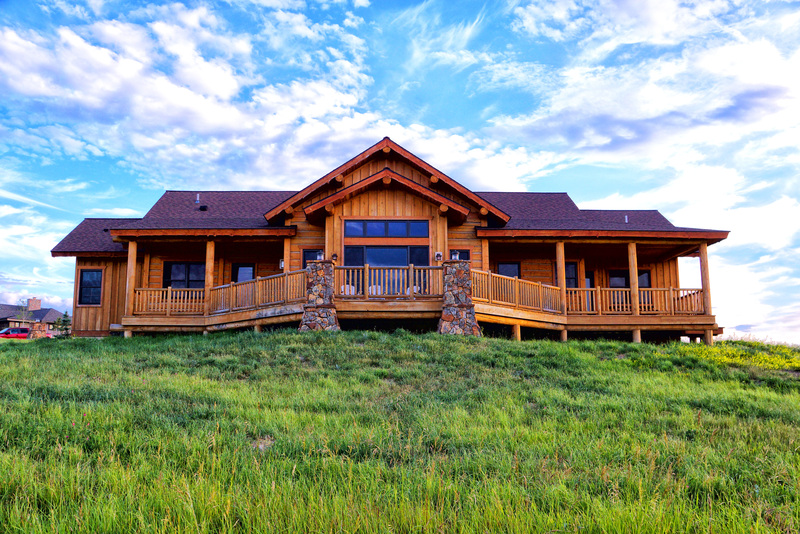 The 3 Private 2-bedroom Member’s Cabins sit just above and adjacent to the main lodge. We are a family-oriented facility and encourage families to enjoy the ranch together in this incredible environment for bonding. If a child has an interest in participating in the adult activities, they are more than welcome as long as safety permits. We want to assure the experience will be great for everyone, including the child and our other guests. It’s good to see kids share some “big people” time and topics, and it’s great to see the “big people” enjoy this as well. Expect a relaxed, courteous, down-home atmosphere where, again, anyone who wants to be here is welcome by all. We do however, have a vibrant Kids Club program run by enthusiastic Staff Guides that can be enjoyed for ½ or full days when the adults are on more adventurous activities! Are all activities on the Ranches at Belt Creek site? Most of your activities will be at or near the RBC site or 10 minutes away at our Family Ranch, however, you may wish to schedule some activities off-site. Those activities are generally not accompanied by our Ranch Host and can be arranged or accommodated by your concierge. Those activities could be but are not limited to: Health Spa experiences at The Peak, Spa Day at Studio Montage, Bike Rentals, Float Fishing down the Missouri River, Rafting, Kayaking, Swimming pool visits, Jacuzzi or Electric City Water Park Days, Museum Tours, Trolley Charter in downtown Great Falls, Beer Tastings, Roller Skating, River’s Edge Trail hike, Golf at the Country Club, Electric City Speedway, Sales Tax Free Shopping, etc. How are the Ranches at Belt Creek amenities conveyed? manage utility access, road maintenance, snow removal, controlled gate access, and Member access to common areas. May more than one buyer purchase a lot together? Yes, more than one buyer may own a ranch together. What utility services will be available to the Ranch Homesteads? Electric service and telephone utilities will be provided to each property. Property owners will be responsible for individual wells, underground propane tanks for gas and septic. How big are the properties? The properties range from 5-30 Acres. How big is the building envelope? setback from center line of road. You are allowed one house, a guesthouse, and a barn. How many community acres are there? There are 200 Acres to use for equestrian, fishing, 4-wheeling, hiking and biking. There is a Ranch Concierge to pick you up from the airport, take care of your grocery list, and assist you in scheduling any amenity activities and booking excursions. Montana’s largest cities with 75,000 people. It is located along the Missouri River near several water falls on the Missouri. At Great Falls, you’ll find all the western history, art, recreation and entertainment you’d expect and much more. land in the river valley is 3000. Are there views from the property? What species of wildlife live on the property? Pheasant, deer, and waterfowl inhabit the beautiful Ranches at Belt Creek. Home many Ranch Homesteads will be there? There will be 68 Ranch Homesteads located above the River Valley. Is there a Ranch Manager? other services that may prove necessary. Can you rent out your home? Yes and we will also provide property management and have a rental program. Who do I talk to about looking at ranches for sale? Contact RJ Crai with any questions you have about the Ranches at Belt Creek.